1984: A girl danced to a song which said that the fox was getting married when the sun was shining though it was still raining. Fast forward to 2006: The sun is shining from the west. The water droplets are falling in unison in rhythm. The thunder gives the percussion and the lightning gives the sharpness. The crystals hang from the edges of the leaves - all of a sudden there are thousands of crystals at the edge of the grass and at the tips of the leafless branches of the trees. Swarovski could not have done a better job. The crystals from my study room window. They refused to pose in all this splendour for a bad camera though. This is the exam week at IMD and I can already see some signs of wisdom. Unfortunately this one brings in despair. After 31 years of age I have finally become the proud owner of silver hair. It is good to find out that you are becoming wise just before your exams start - atleast you have that confidence if not the confidence of having worked hard enough to know the concepts. Today the time rolled over - the sun has just set and the twilight is slowly fading away at 8 p.m - my classmates who are not used to this are still not hungry. After having stuffed myself with strawberries all day neither am I. I was quite happy to see the sunlight still strong until I remembered that I will soon miss the darkness - soon the sun will refuse to leave even at 11 p.m. Being at IMD the good thing is that you will still be up and in school to wish the sun goodnight - well, there are some bright side to things too. Now that I have procrastinated enough before opening my Finance book and analysis of Nestle's and Kellogg's financial statuses, let me finally get back to those monsters. Studying with people from different countries can be quite an illuminating process. Many often the stress is put on the "diversity" aspect. As a result I am often struck by similarities. It does not matter how far one country has been from another in distance - there is something similar in the culture built up over the centuries. Hence when my African classmates talk about some of their habits back in their rural areas I am struck by similarities in our part of the world... and this is not the first one. Hence when I read Ramine's diary entry I was struck by the one factor that seems to have some parallel. 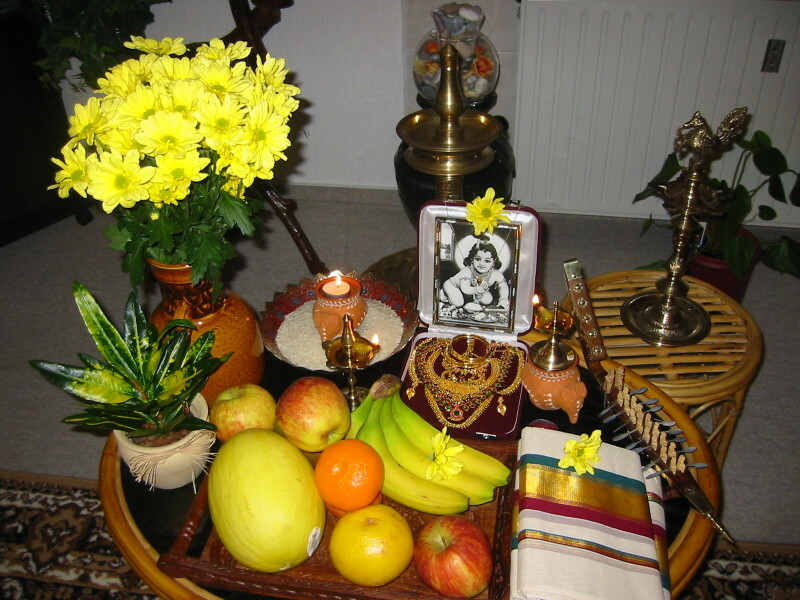 During Vishu (our New Year) we also keep something similar to "Haftseen" - of course there are variations in what we keep .. but nevertheless we still keep a tray with fruits and few more important things to us like the yellow flowers. 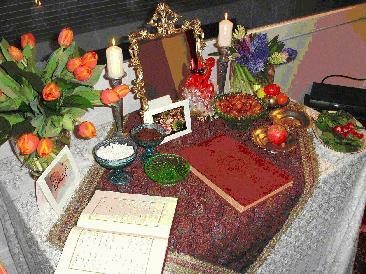 Here is a picture of my friend's kani and one of the Haftseen. Sometimes when you are doing business you harden your heart and go ahead. So what happens when you walk into the negotiation room and find your closest friend sitting on the other side of the table of the group only group you can really squeeze in your negotiation? You harden your heart and when you look at him you pull a veil of disguise over your eyes - yet when you twist the tale to suit your business needs there is a squeeze to your heart and a lump in your throat. You hope he does not catch your naughty smile. Well, last couple of months have seen us fantasizing, synthesizing every behaviour and thoughts. We have been lost in our PDE exercises, group exercises, surprise quizzes, illnesses, getting grades back, getting depressed about them and then comforting ourselves saying that that is no reason why we are here and we have all got closer supporting each other through some difficult days. As we draw towards the end of the first module our group is feeling quite emotional. We will have a new group at the end of the exercise - we are curious about whom we will work with. Yet the melancholy of parting encompasses us at times. It is already 2.5 months since we are here. I see the year flying past. Soon I will be back at my desk, away from these wonderful people - isn't it all flying too soon? Two of us are in our rooms typing away on the LPO paper. I just started evaluating the group members and then decided to postpone the exercise when my mind is cleared of all the wine that I had. The lake lies silent, the next day is just about to start.